If there are two subjects women know, they are friendship and food. Numerous authors have combined these themes and come up with charming, even moving, narratives. Unfortunately, Sheila Roberts is not one of them. Her newest book, Bikini Season, suffers from flat, stereotypical characters; endless cliches; and a predictable plot. I've read (and seen on the movie screen) this same story a million times. Not that it doesn't have its charming spots, but overall, Bikini Season doesn't bring anything fresh or new to the chick lit/romance scene. The story features four women - Erin, Kizzy, Megan and Angela - who form the Teeny Bikini Diet Club to help each other lose weight. Each woman is slimming down for a different reason: Erin wants to fit into her wedding dress; Kizzy needs a better doctor's report; Megan longs to sculpt a body that matches her keen mind; and Angela has only one aim: to keep her husband. Together, they whip up healthy food, sweat it out with Dance, Dance Revolution, and help each other with all the doubts, frustration and hard work that comes with losing weight. Their goal? To don bikinis on July Fourth in celebration of their new bodies. Of course, no one's journey to skinny is the same, and these women are no different. While dealing with their own unique issues, each woman learns their own valuable lessons. Erin's best laid plans crumble when faced with a stressful job and a cheapskate fiancee. Trips to Safeway for chips and salsa only bring her more anxiety, since it means facing extra calories and dorky Dan Rockwell, who never misses a chance to harp on her Prince Charming. It doesn't help that his presence sends zings up and down her body. Does Dan have a point? Is Erin marrying the right man? Kizzy has to deal with her meat-and-potatoes lovin' husband, who sabotages her diet at every turn. How can she get him on board so they can both get healthier? Megan's law firm is filled with "pencils" - thin, attractive women who seem to reel in clients with a mere flutter of their eyelashes. Megan's competing with them for a partnership - but can her brains beat out their beauty? Or will she have to abandon her morals to get ahead? Angela's dismay begins when her husband hands her a snapshot of her at an office party. In the photo, her frumpy self is seated next to his skinny, cute assistant. Angela gets the message loud and clear - obviously her husband prefers his hot co-worker over his plus-size wife. Or is she just being paranoid? She launches a sure fire plan to win him back - a plan that includes pole-dancing lessons and goodies from Victoria's Secret - but is it enough to keep him content at home? Or will she drive him away with her distrust? Ultimately, the most important question is: Do the Teeny Bikinis succeed in their weight loss goals? Or, is the weight really that important in the long run? Each character will have her own answer. I think the idea behind this novel is solid (if familiar), but the plot is so cliche, so predictable that it drowns out all of the book's originality. The characters are one-dimensional paper dolls, who act in ways exactly prescribed by their stereotypes - Kizzy, for instance, is an African-American woman who talks like a Southern preacher (the novel is set in Washington State), worships Oprah, fears her Mama and the church ladies, and eats okra (c'mon, no one in Washington eats okra! ); Erin's fiancee is a control freak who monitors what she eats, how she spends, and who she sees; Angela is a typical hot-blooded Italian, who lives and loves with passion. The characters say nothing unique, do nothing surprising, and are, thus, instantly forgettable. The plot of Bikini Season suffers from the same kind of predictability. Erin's storyline provides the best example. From the moment she encounters Dan Rockwell, it's obvious what is going to happen. It's so apparent, that I guessed the exact (cheesy, unrealistic, wholly unoriginal) way her wedding would end. Angela's story is also completely predictable. The question of her husband's "affair" is resolved in the most cliched way possible. Surely, there are other ways to explore these issues! My big problems with Bikini Season lie in the characterization and plotting. The writing, in general, is not bad. In fact, there were places where I laughed out loud in surprise or delight. One of my favorite scenes is the one in which Angela whips up some low-fat caro cookies. The recipe is printed out, but the directions trail off when Angela dumps the inedible dough into the trash. I laughed as she proceeds to make luscious, fat-filled chocolate chip cookies, only to hide them in the dryer when Erin appears on her doorstep. Still, the unfinished recipe is the clever part of the scene. I also like Kizzy's observation that, "It was one thing to have a body like Queen Latifah. It was quite another to have one like three Queen Latifahs put together. And she was already about a Queen and a half" (19). I enjoyed these bright spots - I was just disappointed that they were so few and far between. The other thing I like about this book is the healthy recipes in the back. Dishes like "Angela's Tomato and Mozzarella Salad" and "Angela's Lemon Parfaits" look tasty, and include nutritional fact, including Weight Watchers Points. I'm a Washington girl (born and bred), so I really wanted to like this one from Bremertonian Sheila Roberts. Unfortunately, any originality in this book sinks under cliche and predictability. Even its quaint Washington setting isn't enough to save it. 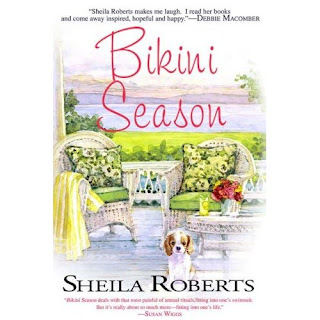 I think Bikini Season would benefit from a good diet that strips off all its extra weight, leaving readers with a simple, slimmed-down story about those two female staples - friendship and food. That is too bad because it sounds like it could have been a good book if it had some better character development. I read this one not too long ago and I felt pretty much the same way as you. After that I needed to take a break from chick lit! Not my favorite genre to start out with. You summed it up nicely.